There's something very incongruous about Eric Jacqmain's video where he demonstrates a solar death-ray with the intensity of 5,000 suns (or so he claims)...backed by plip-plop music you'd normally find in a day-spa. The 19 year old hails from Indiana, where he was hiding this death ray which cost him just $90 to make—before it was destroyed in a fire. Hmm. Suicide? 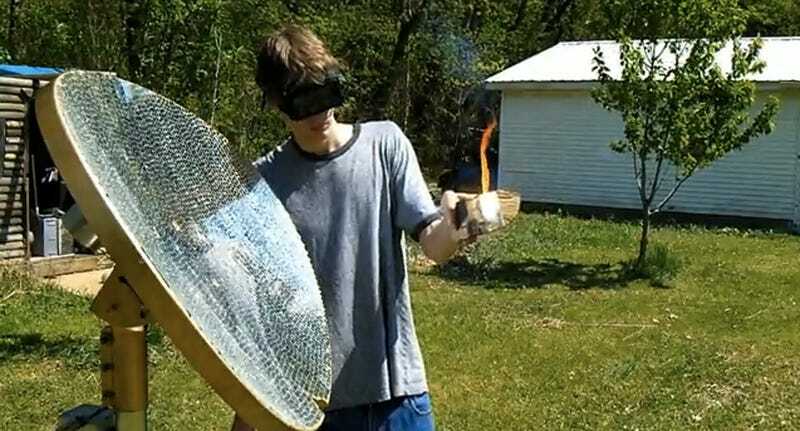 As you can see in the video below, he only had to wheel the 5' 9" dish out, align it so it catches a bit of sun, and then whatever met its "heat spot" (which measured just a centimeter or two in size) instantly caught fire.